Sometimes you just want to make a beautiful, cuddly knit blanket that doesn’t take a whole lot of brain power or time. 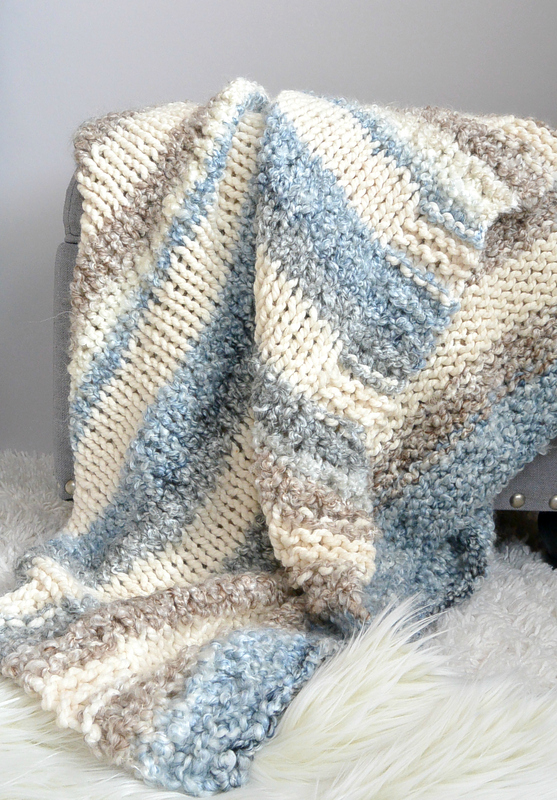 This super easy knit blanket works up VERY quickly and it’s really soft as well which I love. 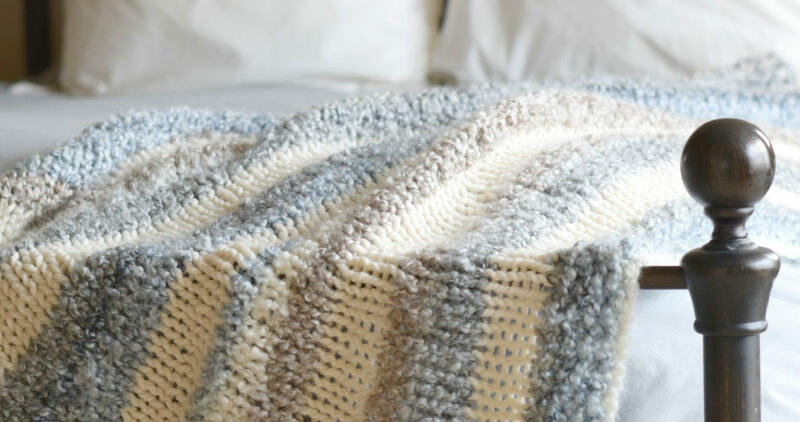 The inspiration for this blanket came from some throws that I saw last season at Anthropologie, only their blankets included brighter colors (and of course weren’t as special because they weren’t hand made – lol). I used two completely different yarns for this knit throw design and I love how it creates a really squishy and interesting texture. It also goes to show that if you’ve got various yarns of the same weight, it’s possible to put them together and create something pretty. Who else ends up with several partial skeins after the holidays? 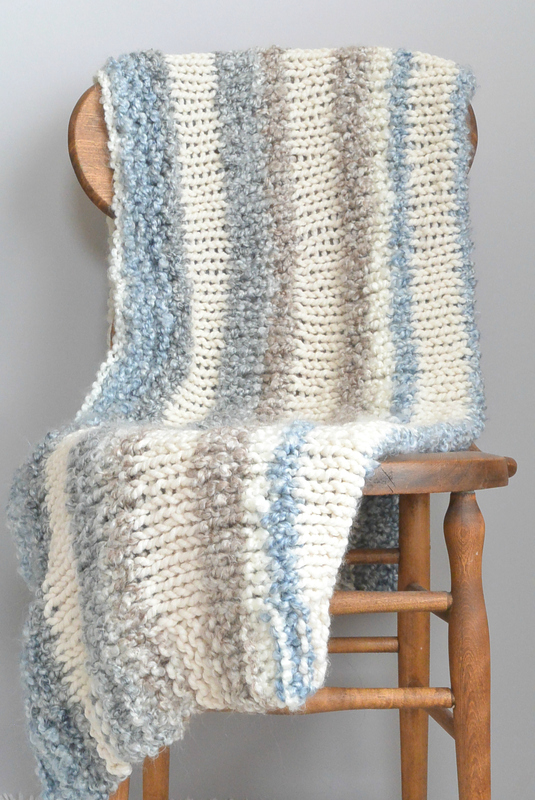 You can take all of those super bulky yarns and easily knit a blanket similar to this. Some of you saw that I just re-organized my yarn room (here) so I don’t have as many partial skeins as I did a few weeks ago, but I still have plenty of yarn that could use a stash buster project. As usual, you can scroll down to see the free pattern below or you may choose to purchase the kit from Lion Brand Yarn here or the ad-free printable PDF version from my Etsy shop here. 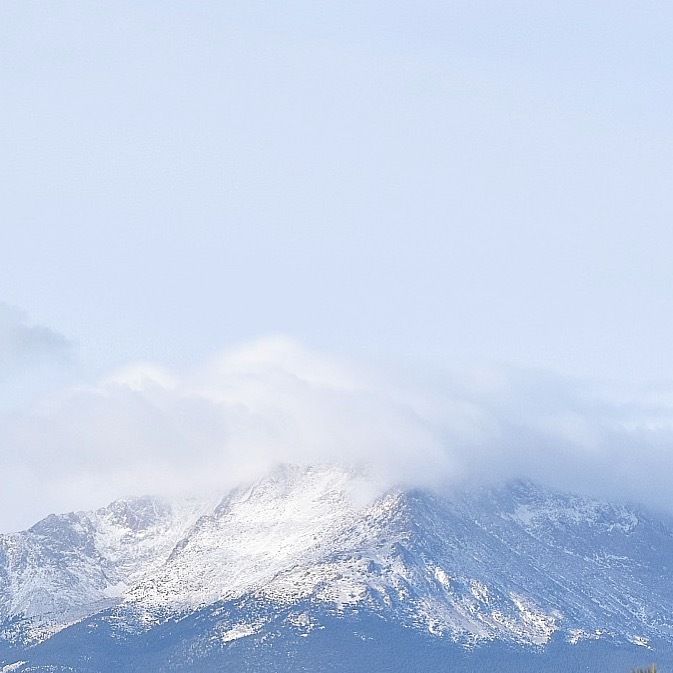 The photo below of Pikes Peak from my back deck is a bit of a color inspiration for this blanket. The fluffy clouds with the white, creams and blues. I didn’t capture the leafless tan and white aspen trees that also are part of the landscape. Winter time is so beautiful and we can get some amazing inspiration from nature and the colors that we see outdoors and in our environment. Even if you live in the city there are colors working together everywhere you look. Fun, right? Blankets make great beginner knitting patterns because they are most often just plain old rectangles. You can use the most basic of stitches to create something really useful for you or your friends. One of my very first knitting projects was a knit blanket for my daughter, (The Native Stripes Knit Blanket here) which took FOR-EV-ER to make. I was a slower knitter back then and let’s be honest, blankets are rather big projects. 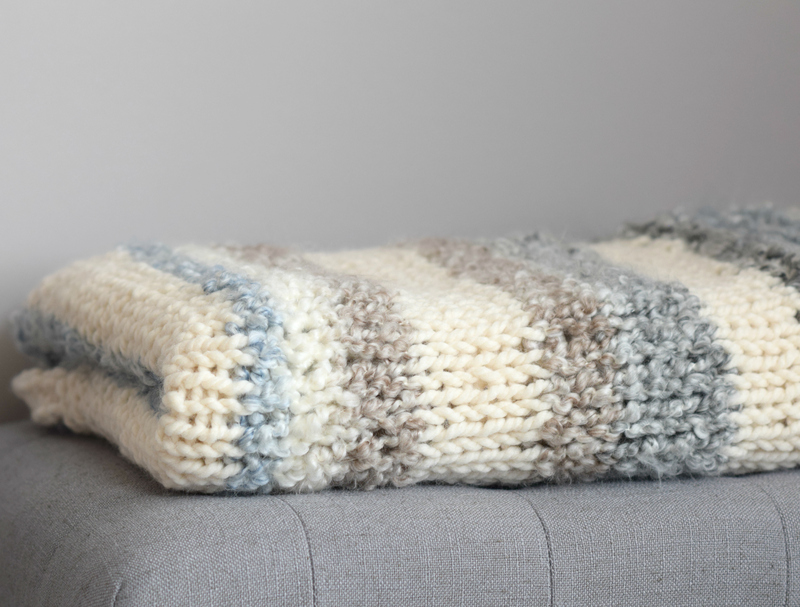 However, if you’re looking for a quick blanket, this Cuddly Quick Knit Throw is a great option as it works up very quickly. I’d say someone with experience can get this done in a week with no problem. The large needles create the trendy big stitches and also lend to a beautiful drape. This isn’t a big throw blanket my friends! It’s more like a lapghan size and this is also why it works up so quickly. It’s perfect for a small chair, ottoman or to simply toss over your legs on a chilly night. I prefer this smaller sized throw blanket to a regular afghan size myself. Throw Blanket Pattern Description: A soft and squishy small knit throw blanket that works up quickly and is beautiful too! The ultimate cuddly knit blanket. You can also now find the kit available from Lion Brand HERE! Notes: You will begin this simple rectangular throw blanket by casting on and working the long edge. Simple color changes are made throughout the pattern. 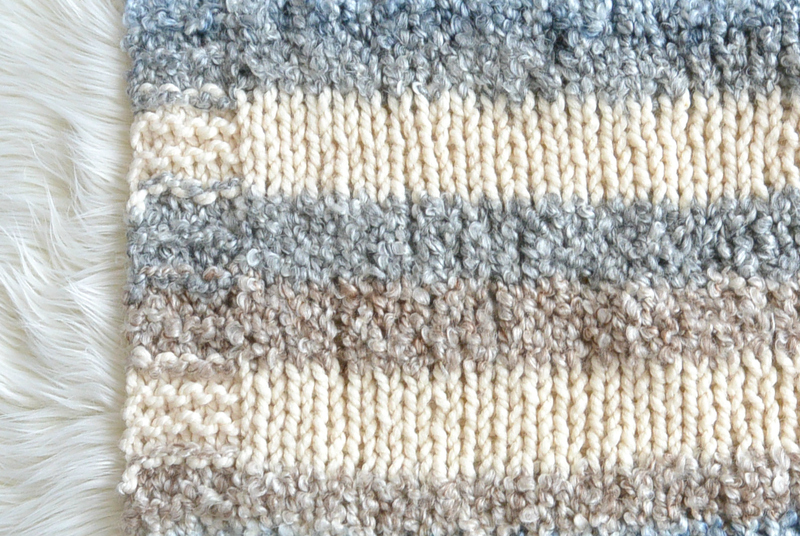 The Homespun Granite Stripes has various colors within the yarn. When you reach a cream colored section in your Homespun yarn, you might choose to wind that yarn and save it for a different project as it closely matches the Fisherman and the striping will not show up as boldly. The ends and edges of the blanket are knit in the garter stitch and the center body of the blanket is in stockinette. If you know how to knit and purl, this will be a breeze! * The right side refers to the side with stockinette stitch. Next, you will repeat this entire Stockinette Section three more times. 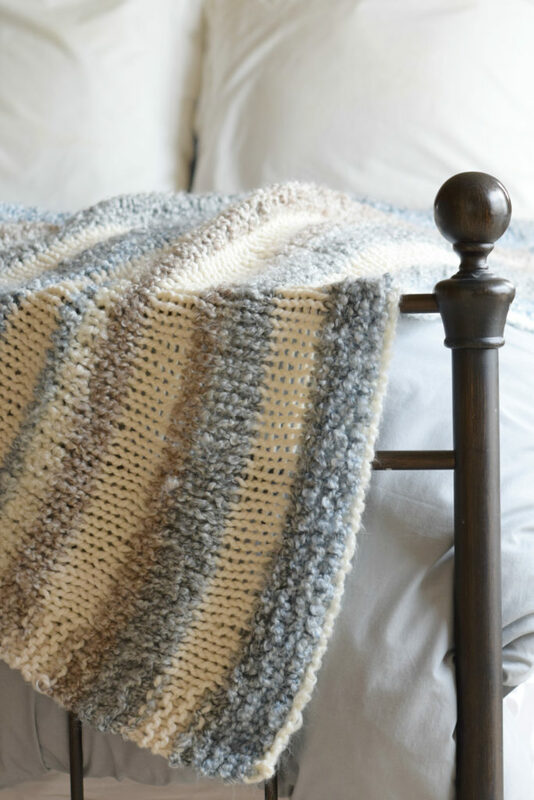 That’s all there is to this simple knit throw blanket! Feel free to be creative with extra yarn and add tassels or pom-poms to the edges of your blanket! You can also easily add fringe along two ends for a beautiful, boho look. If you enjoy working with big needles and yarn you might also like to see my Endless Cables Knit Throw Blanket Pattern! I love Pikes Peak! Where do you live to see it from your home? My parents are in Castlerock and they see it from there!! This is BEAUTIFUL! I have to try this! Thank you so much for sharing! I love getting your newsletter and see your creations! Hi Dee! You just made my day. Thanks so much and I’m so happy that you like it! Hi Jessica. I just wanted to say that I love your designs. So simple but so beautiful. I can sit and watch TV while knitting and I am able to follow the pattern so easily. Your creativity is wonderful. Keep them coming. I’ve made several of your designs already and am anxiously waiting for the next one. Thanks for taking the time to write to me Dolores! I also love to knit while watching TV. It’s so relaxing! I’m so happy you’ve liked my designs and have enjoyed my patterns. Thanks so much for your kind words! That’s so cool that your daughter lives here Kathleen! And what a nice mama you are for making her so many things. They are treasured no doubt. Simply beautiful and beautifully simple! Knitting projects don’t get better than that. I can’t wait to get started. Thank you. This blanket is gorgeous Jess! So clever mixing the two yarns! I was near Colorado Springs for a wedding a while back. It was at the Air Force Cadet Chapel. We also visited the Garden of the Gods. It was gorgeous! Hi Mary! That’s so cool. I’ve been to that chapel MANY times! How neat that you’ve been here. Thanks so much for stopping by! I so love this pattern! And I am so sorry that you to have to look at that view from your back porch every day of your life, ha ha ha. Love all of your designs; I look forward to whatever you come up with next. Hi Cyndi! Lol! Yeah, it’s pretty rough. So glad you like my designs and this pattern. Thanks so much for taking the time to let me know! This is beautiful! I’ve got the inspiration flowing… whenever I get your newsletter there’s always something there that I latch on to immediately. Thank you for the patterns! Yay for inspiration! That makes me so happy Joy! Thanks for letting me know! Thanks for the gorgeous pattern Jessica! I am going to two bridal showers this spring and I wanted to give them something “Hygge”.. This fits the bill perfectly. BTW – I lived in Colorado Springs years ago growing up. Have so many fond memories. Gotta get back there some day. HiJessica. Thanks so much for sharing this wonderful pattern. I make Prayer Shawls for women I know who are having trials and challenges in life. Just today I heard of a friend who is going to go blind and I wanted to make something special for him. This will be my new go to pattern for my male friends who don’t necessarily want a shawl. Once again thank you for generously sharing your talent and inspiration. How awesome that you can knit and have a nice cup of tea and look out at that beautiful view! No wonder that you are inspired to make such gorgeous patterns. I love these colors together and that it’s self stripping. And of course that it’s knitted. My favorite. Ladies I just have to say go to Jessica’s archives and check out her Native Stripes blanket pattern that she’s mentions above. It is my favorite blanket pattern on the Internet. It’s so easy and the colors are beautiful. I loved it so much I made two! Lol. It’s made with two strands of soft yarn held together so it’s really soft and squishy. Thanks for all your patterns Jessica. You make it easy for us. I still remember clearly when you shared a photo of your Native Stripes Blanket with me on Facebook. You did such a beautiful job and you’ve been such a source of support and inspiration ever since. Thanks for taking the time to write here on the blog today my friend!! My daughter lives in Peyton, Colorado. I enjoy visiting often. Nice blanket and idea of mixing two different types of yarn. I like it. Thanks for sharing. So glad you like the mixing of the two types of yarn Alka! It’s great to hear from you and I appreciate all of your support and reading your comments here on the blog. Have a great week! If I wanted to make this a Throw Blanket size, how many stitches should I cast on? 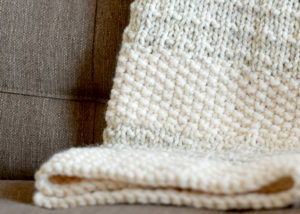 cuddly quick knit throw blanket pattern. If I wanted to make this a throw blanket size instead of a lap blanket , how many stitches should I cast on? This is so beautiful. Is it possible to do this by loom knitting? I’ve only used a round loom to knit a hat once, so I’m not sure. It is very basic though! I purchased the materials needed to make this blanket …loved the pattern. However, while working with it for about 10 inches, the cord connecting the needle broke and I lost stitches, not realizing what happened. My husband used tape to connect it together, and I picked up the stitches and continued. Then the other needle broke after about 10 rows. I figured this might continue to be a problem, even if I exchanged the needles, so I took everything back to Michaels and decided to discontinue the project. Very disappointed that I could not make the blanket. Oh Sandy! That’s terrible. I have had the same thing happen to me with the plastic tip needles from Michaels. I’ve never bought those same needles again for that very reason. So sorry you gave up on the blanket – you might consider investing in higher quality needles as I realized was necessary for me. You are probably right. A better needle would probably work. I do like your patterns and have success with them. Thanks. I love this blanket! It works up so fast! But I’m having trouble weaving the ends in…. any suggestions? I live in Monument and also have a view of pikes peak! That makes this blanket even more special! Hello my neighbor Donna in Monument!!! That does make the blanket more special indeed! As for weaving in the ends, I don’t really have any special trick for it besides I do keep my ends nice and long to ensure I have plenty to work with. This blanket’s a little trickier since it’s such a loose knit but the ends on this blanket are woven in just the same as my other projects. Hope you can get it to work! Wondering if the amount of yarn specified is correct? Next line in brackets it says…. (pattern uses 670g)!!!! Is that 670g of the fisherman yarn? Can someone tell me if 2 skeins is right or do I need 4 skeins? In the beginning of this blanket the pattern says to knit across to 3 1/2 inches. Do you know how many rows that would be exactly. Not sure if I should be measuring 3 1/2 inches from the top of the needle or the bottom of the needle? I am a beginner knitter and I thought that this would be a fun blanket that would be easy to knit. I’ve only completed a couple of projects and so far I know how to knit and pearl. I bought the yarn and needles for this today. I noticed that the granite colors don’t always show and that there is a lot of the cream color. I cut the granite yarn so that I could have the blue show right away on the first rows. Now it’s turning into the cream color. I’m not completely sure how to add the fisherman thick and quick yarn. I’ll watch some you tube videos on how to add a new yarn. I’m excited to make this and I hope that it turns out so that I can give this to someone in my family. Thank you for the pattern! I hope that it turns out as beautiful as yours. You’re correct! Sometimes there is too much white in the granite, so I take that out. You do have to do that on occasion unless you want large sections of white/cream! Once you figure that out, you should be good to go! I can’t tell from a quick look at the pictures and pattern if the cast on edge is the long 51 inch edge or the shorter 32 inch edge. It seems like it’s the long edge. Can you tell me? Hi Ana! Sure – it’s the long edge! Yes you got it Lori, the cast on edge is the length of the blanket!